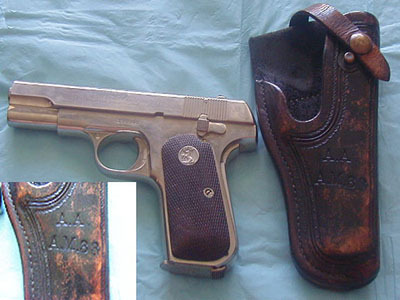 Nickel plated Model M .380 (serial number 100046) with original holster carried by an airline pilot in 1930 when he flew for what became American Airlines. He had to carry a pistol for the mail and when he was with a civilian pilot for the Air Transport Command during WWII. There are no specific markings on the gun (aside from the owner's own identification number, however, the holster is leather with an AA stamp (for American Airways), AM33 (which means Airmail Route 33).